Loved this beer in the big bottles! !...Now that its in the 12oz 4-pack I am sold!!! I live right down the street from the distillery and they give tours every weekend. If you haven't tired their whisky and bourbons u must.. they just released a Beer/White whisky blend that is very unique!! Hopefully got extra'd a bad bottle - completely over-carbonated, which prevented being able to enjoy the flavors they attempted to present here. A: Wow--I tipped my Duvel tulip rather steeply and poured slowly, and this thing still created a massive head. Frankly, it's pretty ridiculous, but I found it endearing. The lacing is thick; it clumped on the glass, and a circular mound on top maintains composure despite everything happening around it. Color is pitch-black, thick with viscosity. S: Hints of cayenne pepper, malt, and obvious mesquite-smoked wood abound. There's not a whole lot of subtlety here, but it knows what it is. It leaves a really lovely aftertaste. T: Vanilla, chocolate, and smokey barbecue are the plate du jour. I could definitely see this paired with a robust red meat cut and some hearty mashed potatoes. Using this for a marinade could probably do some wonders, too. M: A nice, milky quality gives this some smooth character. It's a great sipping beer. With some warming, it really opens up nicely. O: Not bad at all. While I wouldn't go out of my way to have it again for drinking, this would provide an incredible nuance to marinated meat destined for the grill. I'll pick it up again for that reason. Quite an impressive beer. 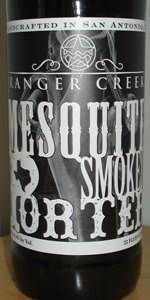 The smokiness and mesquite are bold and reminiscent of the scotches I like, but no scotch is this creamy and chocolatey.